designed to accommodate a 20-round magazine, the M76 grenade launcher, and the M6 bayonet. The overall length of the rifle (with a flash suppressor) is 41.31 inches. The weapon has a muzzle velocity of 2,800 feet per second and a maximum range of 4,075 yards. Empty, the rifle weighs about 9 pounds. Fully loaded and ready to fire, the rifle weighs about 11 pounds. THE M16A1/A2 RIFLE Learning Objectives: When you finish this chapter, you will be able to Identify the differences between the M16A1 and M16A2 rifles. Recognize procedures to load and unload the magazine. I d e n t i f y p r o c e d u r e s f o r c l e a n i n g a n d maintaining the M16A1 and M16A2 rifles. The M16A1 and the M16A2 rifles (fig. 11-3 and fig. 11-4) are magazine-fed, gas-operated shoulder weapons. They are chambered for a 5.56-mm (about .22-caliber) cartridge. The magazine has a capacity of 20 or 30 rounds and may be loaded with any amount, up to capacity. The caliber may seem small, but the bullet has a muzzle velocity of more than 3,000 feet per second and a muzzle energy of more than 13,000 foot-pounds. A forward assist assembly, located on the right rear of the upper receiver, permits the operator to ensure the bolt is locked in the forward position. They have a maximum effective range of 460 meters. DIFFERENCE BETWEEN THE M16A1 AND THE M16A2 The steps you take when field-stripping and cleaning the M16A1 and M16A2 weapons are basically the same. However, there are some major differences between the two weapons. These differences include the barrel, sights, selector assembly, ammunition, and hand guards of the two rifles. WARNING Ensure you are using the proper ammunition for the M16A1 and the M16A2. Improper use may cause serious damage. 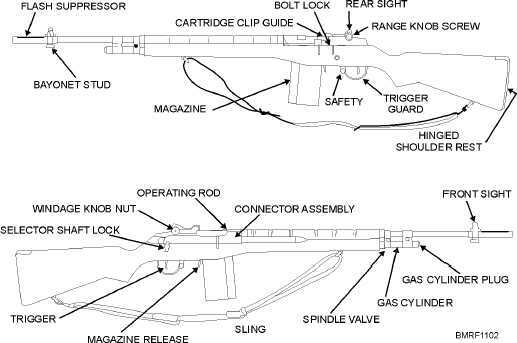 11-3 Student Notes: Figure 11-2.The 7.62-mm M14 rifle.